Bolts of lightening followed by deafening detonations struck to the heart of Rock Island in the wee hours of Sunday, June 1, 1913. A fire ensued, quickly destroying the Tri-City Railway Company car barns on 5th Avenue near 35th Street. This Real Photo postcard from the Augustana College Library Special Collections shows the day-after results. The upper part of the 2-story front of the 400 x 200 foot brick building contained offices and resting rooms. The single story rear portion which held the cars had earthen floors and a wood truss roof. Thirteen tracks inside branched off from Fifth Avenue using switches and turnouts. Flames leaped a hundred feet into the sky creating a red glow that could be seen for miles. Great clouds of black smoke rolled up from the scene, with the chaos accompanied by continuing crashes of thunder and flashes of lightening. Firemen were forced back and forth in a strange dance with the inferno. When it appeared that the blaze was out of control, a taxi had to be dispatched to the Moline fire department to request assistance because the intense heat had severed electrical and communication lines. 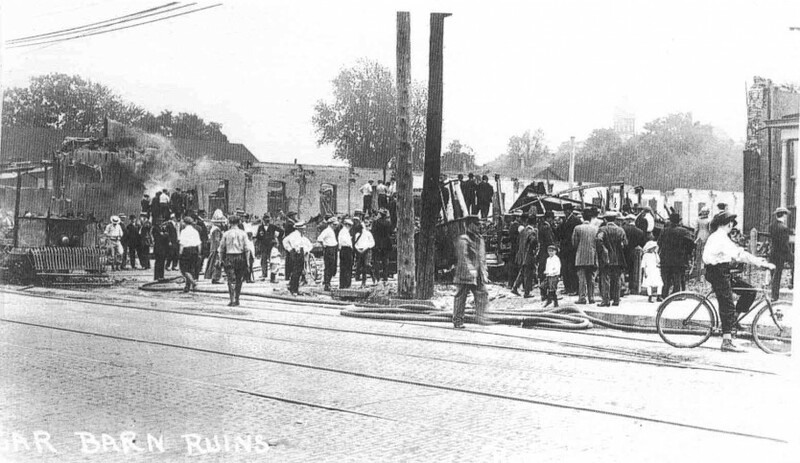 The destroyed cars had been built in Cincinnati, St. Louis, and even Rock Island. Insurance valued at over $355,000 was in place to cover the loss, with nearly seventy-five different insurance companies underwriting individual policies of $1000 to $11,000 in value. Other buildings within a radius of 300 feet of the burning barns occasionally burst into flame, but most were quickly quelled by firemen. After the home at 3170 5th Avenue erupted in fire, nearby residents began to evacuate, removing furniture and belongings. The pavilion at Huber’s Brewery, located behind the barns, was little affected even though it burst into flame several times. Despite valiant efforts to contain the fire, dawn saw only a mass of twisted iron and steel where the car barns had been. Streams of water continued to play on the ruins throughout the day so the wind could not fan the smoking embers into flame. A wall that still stood at the front was pulled down by the firemen to keep it from falling on spectators. The view is looking southeast from the brick pavement of Fifth Avenue where the railway tracks can be seen. Smoke is still emanating from the ruins, although the crowd seems unafraid. To the far right, a corner of the heavily damaged brick house can be seen. The dome of Augustana’s “Old Main” is visible in the distance. Disaster was nothing new for Rock Island’s transportation business. The first Moline-Rock Island travel hub was a horse railway barn on this same stretch of Fifth Avenue that was called an “architectural ornament” when it opened in 1868. It was destroyed by fire in 1889, along with fifteen vehicles and 42 horses. A decade later, the company was reorganized and taken over by local businessmen who formed the Tri-City Railway Company. Two days after this fire, plans were already underway to build a new car barn at an adjacent Fifth Avenue location. An existing order with a St. Louis company for new streetcars was increased to replace the lost vehicles. And despite the temporary inconvenience of borrowed old cars, the streetcar business continued as usual. This article by Diane Oestreich is slightly modified from the original, which appeared in the Rock Island Argus and Moline Dispatch on February 20, 2005.